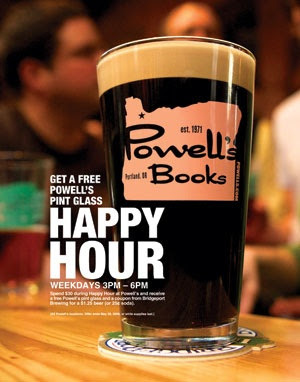 Customers at Powell's Books, Portland, Ore., who spend at least $30 between 3 and 6 p.m. any weekday through May 29--or until supplies last--receive a Powell's pint glass and a coupon for either a $1.25 beer or a 25-cent soda at Bridgeport Brewing. The pint glasses, which come in blue, green, red and pink with Powell's logo on them, can also be bought for $4 each. On the other side of the glass is the saying, "The NW's Mightiest Bookstore!" Get thee to Powell's and get me one of these glasses!! Aw man! Now I have to find time to drive down to Portland and my weekends are booked this month. Hrm.